And you’d have a point. Real doctors would write real prescriptions that real pharmacists would fill for spirits during prohibition. This Buchu Gin has not been produced by prohibition. At the time of trying, this sample was in the vicinity 100 years old. 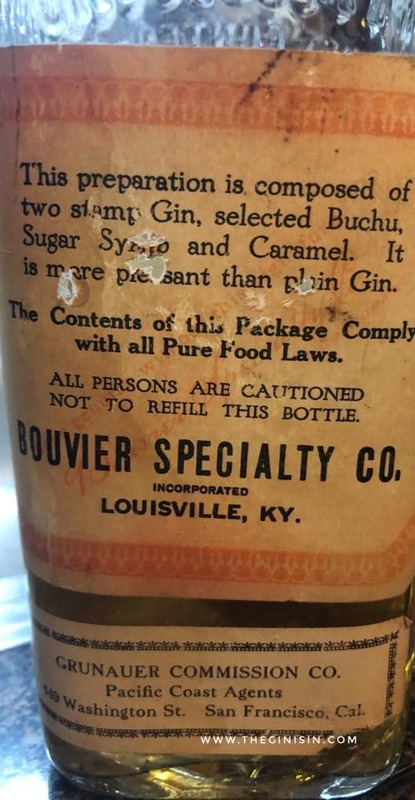 As with our other vintage spirit reviews, keep in mind that Bouvier Buchu Gin is not at it’s peak and its extremely likely there’s been significant changes in the time it spent in the bottle— no matter how well stored. Buchu Gin was made from a base of “double stamp gin,” indicating that it was of high medicinal quality. It was sweetened with sugar and colored with caramel. Though procedural notes are sparse, the Buchu was likely macerated in the double stamp gin rather than distilled. Buchu has been heralded as a “miracle herb” by the holistic medicinal press. Native to South Africa it has been an important part of native South African medicinal cultures for centuries. The plant is an evergreen shrub with potent aromatic leaves that on their own have a mentholic, almost peppermint like aroma. 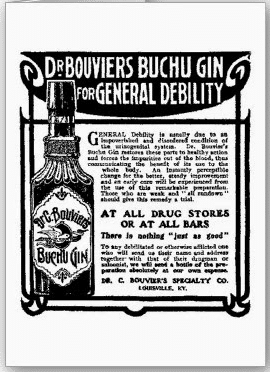 Bouvier Buchu Gin has a mentholic, almost suggestive cherry cough drop aroma. Slightly terpey, it’s not altogether off-putting for a spirit as old as it is. Sipped, it has a more camphorous flavor. The sweetening on it does remind my distinctly of a cough syrup and the flavor is like drinking a moderately viscous Mentholatum ointment* with a slight hint of birch twigs. There’s a slight terpey-ness to the palate that suggests pine or even juniper; however, any more complexity to the base gin has eroded with time. Bouvier Buchu Gin is a curiosity and a relic of another time. If you’re interested in tasting a bit of gin history— and you can find some— it’s worth a sip. But Bouvier Buchu Gin won’t be appearing any time soon at bars that specialize in vintage pours and antique martinis. It’s just not that good. The best I can say about this is that it has a better flavor than another mint vintage gin I’ve tried that’s nearly 70 years younger. *Perhaps that rub is a Western New York thing. The closest other analog might be the smell of back heating pads or Vick’s Vapor Rub.